It’s our first birthday. We want to thank you for being such amazing patients and the support we have received. We have always worked on the belief that prevention is better than cure and we have applied this to the highest quality of service to help you and your families get better. Call The Doctor has transformed after hours care in Hobart to make it accessible to patients as needed. 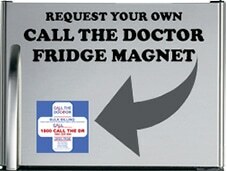 Please continue to recommend us to family and friends and support you locally owned and operated doctor service. Your community support will help us expand the service areas to help more people in need. Call The Doctor launches in Hobart 16th February 2015. Ever needed an doctor after hours? The locally owned and operated service has a Doctors on call to make house calls from 6pm-8am on weekdays, after noon on Saturdays and all day and night on Sundays and public holidays. It is A BULK BILLED service for Medicare or Veterans Affairs card holders. What might happen without Doctor home visits?? 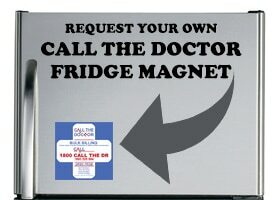 Request a CTD Fridge Magnet! *Bulk billed for patients that have a healthcare card, concession card and/or pension card.